The holiday period is not far away. For many business owners, this provides a good time to reflect on 2016 and look at ways to increase the bottom line for a new and prosperous 2017. 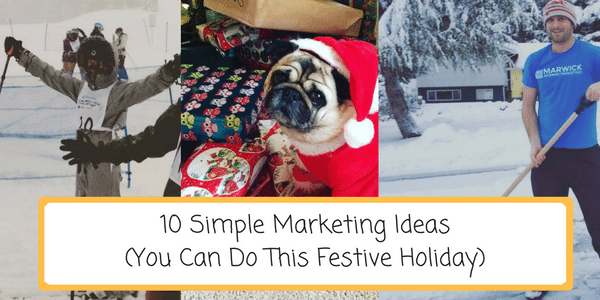 I’ve put together my top ten marketing tips YOU can do over the festive period, giving your business that competitive edge in the new year. With so many different social media channels; Facebook, Twitter, Google+, Linkedin, YouTube, SnapChat etc it pays to spend a couple of hours going over all your social media accounts making sure the branding and key messages are the same throughout. Make sure your contact details, web address and description is correct. Why not also take this opportunity to update your passwords? There is a good chance you set up your social media some time ago, so does it still reflect your business and its customer promise? If someone landed on your Twitter page would they have a good idea of what you do, where you do it and why you’re the best at it? We recently interviewed Global Marketing Director at Herschel Supply Co about social media and how small companies can use social media. Check it out here. Remarketing can be done via Google Ads (formerly known as Google AdWords) and Facebook. A small snippet of coding is added to your website and this captures a user’s IP address and then delivers adverts to that user on other websites. It’s a tried and tested method for staying top of mind, increasing brand awareness and actually costs very little to do. The way people search on Google is changing, so you might want to rethink your target keywords in organic search engine optimization. With the advent of voice search, keywords are being replaced with search phrases. Check out my top 3 SEO Trends for 2017. It may have been a few years since you updated your website, re-read the about us section or even Google’d your company name. Try and walk the walk of a potential new customer. Do you see the outdated information? Services no longer provided? Are you showcasing your business as best as you can online? Opening times not correct? Is your profile photo on Linkedin from 8 years ago? This year we caught up with the founder of Unbounce, Oil Gardner, he shared his thoughts on what makes a killer website. You can watch the video here. The holiday period is a great time to connect with customers and seek out feedback on your company. Business owners are in a better mood (stuffed with turkey and wine) and are more likely to take the time to provide feedback and leave a review. Online reviews (Yelp, Google, Facebook) are critical to the success of any business. Ensure you’re working hard to increase positive reviews, and manage any negative reviews in a professional manner. What’s worse than an overcooked turkey? A slow loading website! What a year 2016 was! With all that new customer data you’ve gathered, it’s time to show your expertise in your sector. A great way to do this is to create a simple infographic. An infographic allows you to display data in an ease to digest way. Some ideas? If you’re a Realtor list the last year’s real estate stats. Auto dealer? How about an infographic on the top selling brands in 2016? Vet Clinic? How about ten things you can do to keep your dog healthy in 2017? Here’s an example of one we created this Spring. This is a budget killer. If you’re running S.E.M (Search Engine Marketing) also known as Pay-Per-Click ensure you are monitoring negative keywords. If you’re not, you could be wasting hundreds of dollars on bad website traffic. What’s a negative keyword? Good question. Let’s say you run a shipping container rental company. You want your advert to show for keywords like “Shipping container” and not for “food container”. Some common and generic negative keywords also include things like “free, cheap, how to, discount, learn to” so give it some thought and jump in and remove those keywords. Ask yourself this, does your marketing pay for itself? Are you able to tangibly know which marketing channel works for you? If not it’s time to review what you’re tracking and how you’re tracking it. Google Analytics allows you to set up Goals and Conversions and is a great place to start. Commit yourself, no matter how busy business becomes in 2017 to monitor your marketing efforts. If times are hard, market harder. If times are good, invest in the longevity of your marketing and brand messaging. The digital marketing landscape changes dramatically week to week. This provides savvy business owners opportunity to get ahead of the competition on almost a weekly basis! If you have a question on any of the above please reach out on Linkedin and I’ll be happy to help!